Last week we informed you about the spat between China and Sweden where the government of the ‘middle kingdom’ blamed the Scandinavians of ‘inhumane treatment‘ of their citizens after Stockholm police carried three Chinese tourists out of a hotel as they arrived some 12 hours before their official check-in time (see our related coverage). The Chinese government showed the segment on their national news, without the overly dramatic screaming of the tourists who claimed ‘this is killing, this is killing,’ but simply focusing on older Chinese people being treated badly by Europeans. 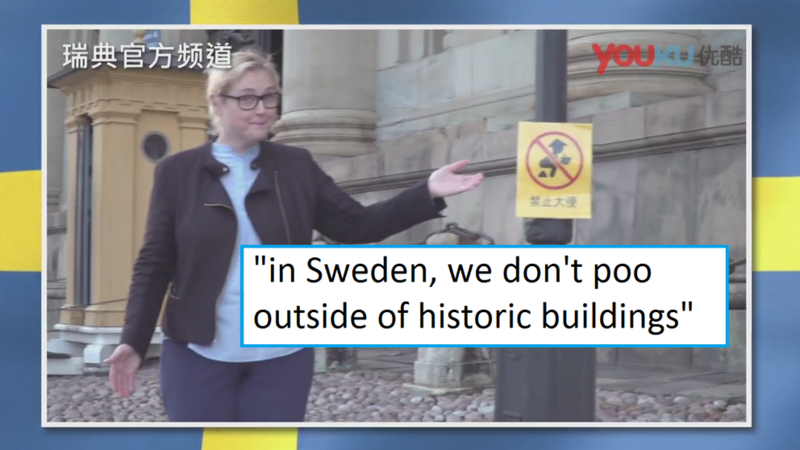 Related coverage: <a href="https://thegoldwater.com/news/37338-China-Says-Inhumane-Treatment-Of-Tourists-Sweden-Responds-Are-You-Kidding-Me-Video"> China Says ‘Inhumane Treatment’ Of Tourists – Sweden Responds: Are You Kidding Me? (Video)</a>. Furthermore, during our reporting on this subject, we reminded you that last year, China had complained to the UK after a picture making the rounds on social media there showed how a Chinese grandmother helped her grandchild take a dump in the middle of the street in front of London’s Burberry store. In rural China, public toilets are rare and in certain villages pooping in the streets is still ‘done,’ although the government is stepping up efforts to modernize also those areas. In any case, the hundreds of millions Chinese on social media, after seeing the segment and being informed how these local Han Chinese had behaved in Stockholm, didn’t make too much fuss, with many admitting that they were overacting. Case closed you would think. In a clearly satirical (if you’re European) segment aired over the weekend, they did a skit especially for Chinese tourists. It started with: ‘Dear highly esteemed Chinese visitors, here are some tips for when you visit Sweden. Here in the centre of Stockholm, we don’t poo outside of historic buildings…..’ and showed a sign of a man with a Chinese hat eating a bowl of rice taking a dump in the street. The show had uploaded the skit to a Chinese social media site and provided it with subtitles. The Chinese, understandably, failed to see the humour of it this time round and all reactions were quite negative. The Chinese government has now demanded an official apology from its Swedish counterpart whilst the TV show, seeing the uproar, said it was all just satire. What do you think. Did the Swedes take it too far this time or should the Chinese learn about satire? Let us know in the comments section below. 100% free speech, 100% anonymous. i think they need to learn satire. The chinese are the asian version of jews.